Located smack dab in the middle of the northernmost farming communinty in all of North America, and being blessed with tens of thousands of migrating waterfowl in two flyways pouring through our community, its safe to say that our waterfowl hunting is amazing!!! Our vast area is loaded with game as thousands upon thousands of geese migrate through La Crete each year. Since this is the only farmland this far north, it’s a choice stop for a multitude of waterfowl giving you “opening day birds” throughout the season. The goose hunting that we get here is absolutely phenomenal. Greater canada's, white fronts, mallards and pintails make up the majority of the birds but snow geese, ross geese, lesser canada's, shovelers, teal, and a few others are also commonly shot. Our waterfowl hunting is done largely on the grain fields surrounding the community, We have spent our entire lives in the area we hunt, so we know it well and have established good relations with many, many of the farmers and have access to thousands of acres of prime hunting land. Wingmaster Outfitting uses top of the line equipment for all waterfowl hunting. Stand up willow blinds are mainly used but laydown blinds are also available if so desired. We book six hunters per week which allows us to be mobile and be sure to provide you with the high quality hunt you expect. 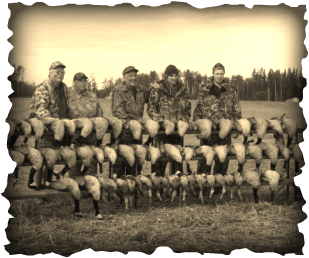 Waterfowl hunts may be combined with other hunts!